Since 2009 there has been a sharp increase in DUI checkpoints that are less about stopping drunk driving and are more about the impound and legalized theft of vehicles belonging to unlicensed drivers. Vehicle seizures have increased by 52% in the past few years, leading to a seven to ten times higher rate of impoundments versus arrests for driving under the influence. 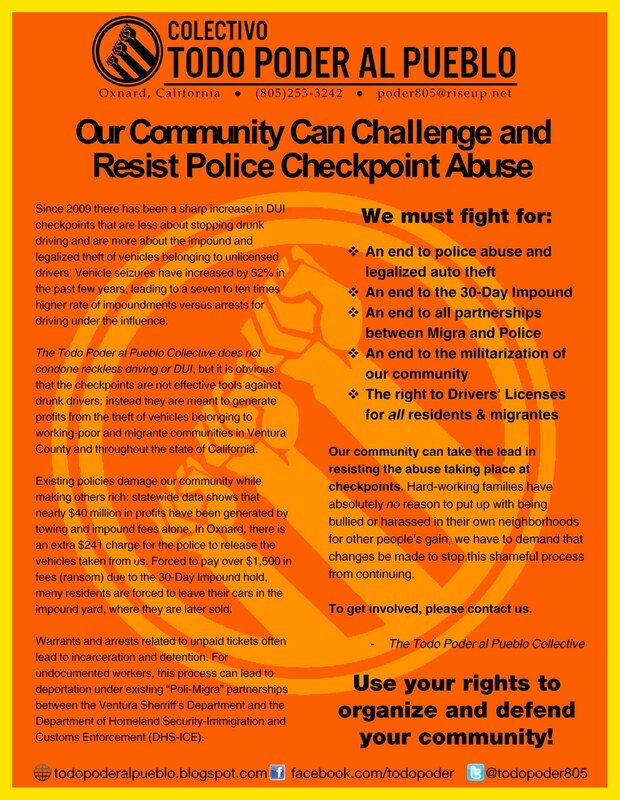 The Todo Poder al Pueblo Collective does not condone reckless driving or DUI, but it is obvious that the checkpoints are not effective tools against drunk drivers; instead they are meant to generate profits from the theft of vehicles belonging to working-poor and migrante communities in Ventura County and throughout the state of California. Existing policies damage our community while making others rich: statewide data shows that nearly $40 million in profits have been generated by towing and impound fees alone. In Oxnard, there is an extra $241 charge for the police to release the vehicles taken from us. Forced to pay over $1,500 in fees (ransom) due to the 30-Day Impound hold, many residents are forced to leave their cars in the impound yard, where they are later sold. Warrants and arrests related to unpaid tickets often lead to incarceration and detention. For undocumented workers, this process can lead to deportation under existing “Poli-Migra” partnerships between the Ventura Sherriff’s Department and the Department of Homeland Security-Immigration and Customs Enforcement (DHS-ICE). 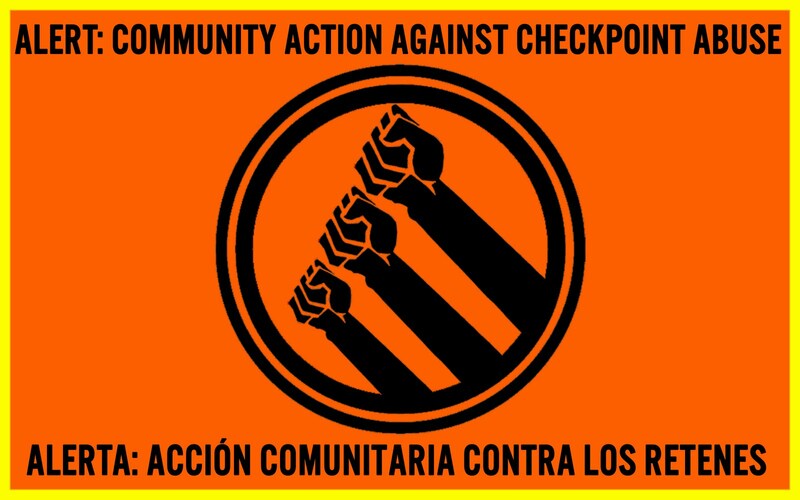 Our community can take the lead in resisting the abuse taking place at checkpoints.Hard-working families have absolutely no reason to put up with being bullied or harassed in their own neighborhoods for other people’s gain; we have to demand that changes be made to stop this shameful process from continuing. Use your rights to organize and defend your community! This entry was posted in Análisis // Analysis, CHECKPOINTS // RETENES, Luchas sociales y solidaridad // Social Struggles & Solidarity, Movilizar // Actions, Notas de prensa // Press releases. Bookmark the permalink.